We spent the night in a ger camp surrounded by beautiful mountains with no sign of a city or any human development around, but it still felt as if we had returned to civilization since we arrived in Hustai National Park. For the first time since we began our travels through the more remote areas of Mongolia, we heard English all around us along with all sorts of European languages, as well as Korean, Chinese, Russian and Japanese. Hustai National Park is well known because of the successful reintroduction of the Takhi wild horse that occurred here, a groundbreaking conservation achievement. It took a major international effort to bring back this breed of Mongolian horse that had been extinct in the wild in Mongolia since 1969. Beginning in 1992, a few of these “Takhi” horses (also known as Przewalskii horses), that had been collected from zoos all over the world, were released here at the park into the wild, where they successfully made their habitat and multiplied. Takhi horses were flown here from zoos in Australia and from all over Europe, and a foundation was established in the Netherlands, to monitor the transport and well being of these small, long haired horses. There are currently about 300 wild Takhi horses living inside the park. Hustai is a beautiful park, with wildflowers, rolling hills, mountains, creeks and plentiful wildlife. There are large rock formations and patches of large Birch forests. There are also visible remains of Neolithic graves, dating from the latter part of the Stone Age. 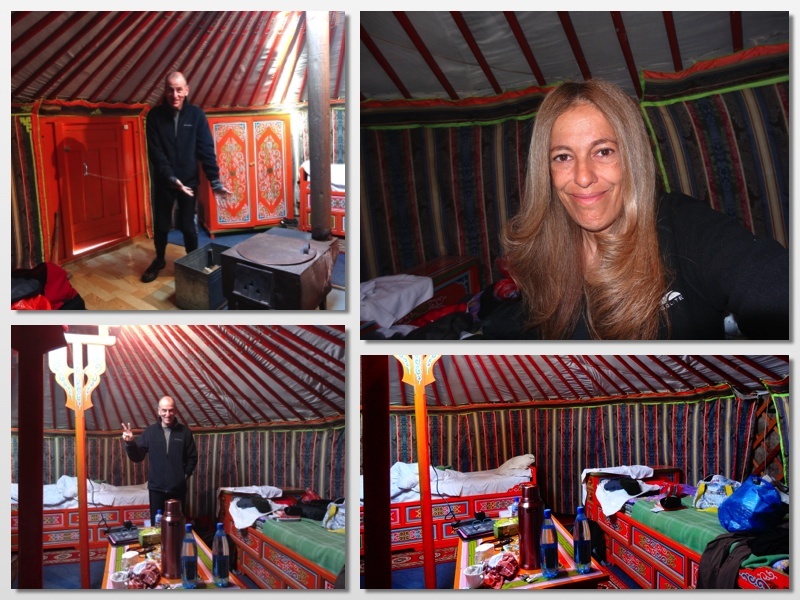 In the morning, after we had eaten breakfast, we were ushered into one of the bigger yurts in the park to watch a documentary about Hustai National Park and the reintroduction of its famous wild horses. The park then assigned us a guide who, sporting a pair of strong binoculars to help us spot the wild horses, came with us as we drove into the wilderness on the Park’s dirt roads. Our guide was a young university student studying business management. She told us that she was aspiring to become an interior designer after she graduates, and that for the summer, she was volunteering at the park. She then told us that the best time to see the wild horses is either at sunrise or sunset, and that they are harder to spot during midday, because they take shelter in the woods or go higher into the roadless mountains, where it is cooler. Our young guide asked us to ask her many questions because she would love to practice her English. She told us that just the day before, a young wild horse had badly wounded by a blue wolf and that they had tried to bandage its leg and release it back with its herd, but that it had not survived. As we drove by one of the creeks, we saw the body of the young foal lying in a field of wildflowers. A “Blue Wolf” is not a special kind of wolf that lives in Mongolia, it is simply the word Mongolians use to describe the color gray. I first encountered it in books written by Alexandra David Neel, who traveled around Tibet almost a hundred years ago. Here in Mongolia, I noticed that they use exactly the same words and description for gray. I have heard Mongolians say: “Wow, look at this beautiful blue baby yak,” pointing to a gray yak, or talking about a blue wolf when referring to a large gray wolf. I also heard Nasaa, our driver, ask his wife Tuya, our guide, not to wear foundation makeup because it makes her look “blue in the face,” referring to the gray tone the makeup gave to her face. We drove for miles through the beautiful park, stopping often to look around and to try to see the Takhi horses. We saw a solitary deer and many marmots, endless butterflies and many wildflowers and beautiful rock formations. We heard the distinctive cries of the Steppe Eagle, who makes a sound just like the whinnying of a young horse. Hustai Park is home to many species of animals, including the blue wolf, Mongolian Gazelle, Lynx, Argali sheep, and deer. We stopped the car and went for a walk around the park. It was a beautiful day, and most of the tourists must have seen the wild horses earlier that morning, because we saw very few tourists around. As we walked, our young guide reached for my hand and held it as we walked through the fields. She asked many questions about my life, and she told me that she does not intend to get married nor start a family, because she wanted a career of her own and a different life from the traditional life she saw all around her as she grew up. It was endearing to walk hand in hand, among the wildflowers and the butterflies, with a young woman I had just met. Finally, on top of one of the mountains, we spotted a herd of wild horses. We hiked towards them, to try and get a closer look. While we walked, our guide Tuya told us about the life of these wild horses. Mongolian wild horses live in small family units of one stallion and up to seven mares. The stallion impregnates all the mares. The young babies that are born almost every year will stay with the herd for three or four years. The young female horses are allowed to stay with the herd, but when the young male horses reach the age of three or four, the stallion chases them away. Many of those young male horses are too young to survive on their own, and so they band together with other chased-away young males to live in groups of males only. When a stallion gets to be too old to protect his mares and becomes less fertile, the mares chase him away. A younger stallion from one of the roaming herds then joins the herd of mares to take the old stallion’s place. The old stallion spends his final days in the wild, roaming until he dies naturally or gets eaten by wolves. We look at nursing homes and feel sad that older people have to spend their later years away from their families, and at times, it seems like the hand of destiny is cruel…. but when you get to know the people, you can see the clear behavior patterns that had pushed those older people away from their children. In life, you get what you give. If someone wants to have a close and loving relationship with another, be it a parent, a husband, a child, a friend or a sibling, one must cherish those relationships and do her very best to nourish them with consistency. Otherwise, people drift apart, seeking their own peace and harmony and avoiding the family members that have hurt them. Years ago, I attended a workshop about dysfunctional families and how to identify their patterns. One of the marks of a dysfunctional family is the need to keep everyone close by. The mother goes to pieces if her children choose to go to a university that is far from home, or a father feels betrayed if his children move to another country. This means that Johnny is known as the clown of the family, and Jenny as the kind and honest one. Jerry is the smart one and Judith is the one who is good with money. When Johnny wants to grow out of his role as the family clown, or if he suffers from depression, he upsets the balance of the entire family unit. The problem is that Johnny needs to grow as an individual to become a whole and complex being, and to do so he must be allowed to be sad and wear other hats that might not fit with his rigidly defined role within the family unit. In healthy families, all the members are encouraged to live apart and develop their uniqueness and individuality. Each member is not dependent on the others for his or her happiness, nor do they abuse their relationship with each other by playing power games. There is nothing wrong with growing apart from the family unit that you grew up with. It is just cultural brainwashing that we are all accustomed to believing. Here in Mongolia, children are sent away to boarding schools at an early age, and often they spend most of their childhood in the company of other kids, and not with their families. They often come home only during summer vacations. In Tibet, Mongolia, Bhutan, China, Sikkim and Burma, monks and masters alike leave their families to devote their entire lives to their spiritual studies, and many never see their families or childhood friends ever again. In these cultures, it is accepted as totally normal and even commendable. Those people are the most respected, and are looked upon as great spiritual beings, striving to move beyond human weaknesses and needs, to help all of humanity to rise in consciousness. Do you yearn for the warmth and closeness of a supportive family? Or do you yearn to grow beyond your human insecurities and weaknesses, to find out who you really are, beyond your imaginary ego structure and bodily identification? Well, all those ideas were running through my mind as I walked holding hands with this young woman looking at the herd of wild horses. Our definition of “Family” is in dire need of expansion. Once, my husband Jules was a stranger to me and now he is my family, closer than anyone else. So it is with everyone on earth. We are not strangers to one another, but friends with whom we have not yet formed a close bond…. In Truth, we are all ONE. Not one family with many members that are all related to one another, but more like ONE tree with many, many branches, which all are One in essence. We returned to our ger camp to have a lunch of handmade noodles with vegetables (called “tsuivan”) and a salad, simple fare that by now had become our favorite food in Mongolia.